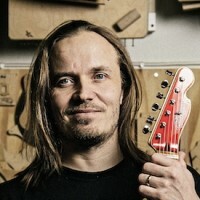 Juha Ruokangas is the founder and sole owner of Ruokangas Guitars. He has designed all the Ruokangas guitar models, and he builds them together with his small “dream team”. Juha studied lutherie in the early 90’s under the guidance of the finest Finnish luthiers. Today Juha is one of the very few Finnish luthiers with a Master’s Degree, and his guitars are regarded in various books, magazines and other independent sources as some of the finest in the world. He works also as the chairman of The Guild of Finnish Luthiers, and he is the vice president of The European Guitar Builders.